The drink water app: The app is literally called “Drink water app” it was free in the apple store. It calculates how much water you need to drink and sends you notifications throughout the day when its time to drink water. The subtle reminder is exactly what I need during my busy days. Throwing in a sparkling water or two: I don’t recommend only drinking sparkling water but one or two in a day is fine. This will give you a little change of pace by adding in the flavor and bubbles. My favorite brand is La Croix. Just make sure that whatever sparkling water you drink is sodium free. Drinking from a cup with a straw: This helps me drink more water in a shorter amount of time. Not sure why, but it works! Flavored/Infused water: Like I said before, sometimes you just need a change of pace. You can use different water flavoring like Mio or crystal light. Another, even better option, is infusing your water. 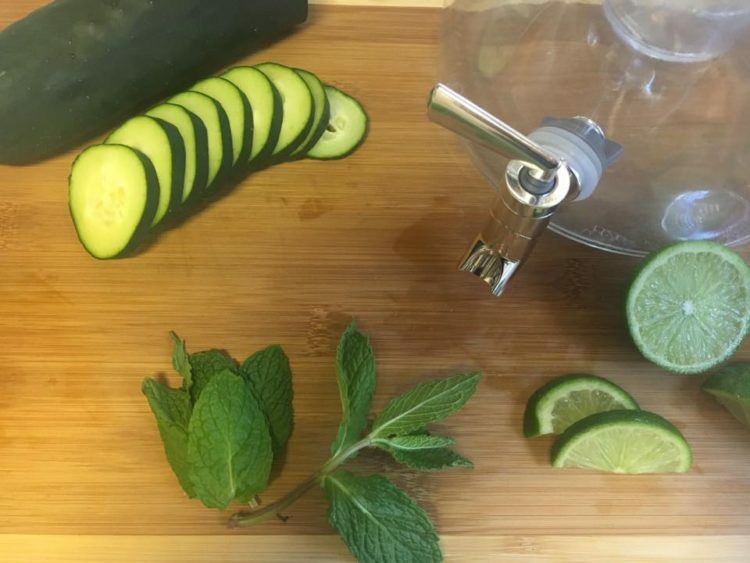 One of my favorites is Mint, Lime and cucumber infused water (Pictured). This keeps it interesting and keeps me wanting more. Labeling a gallon jug with time intervals: All you need is a gallon jug and a sharpie. Make a mark for each hour of the day. This will make it so you know how much you need to drink by a certain time each day to get your gallon in. Try these out and let me know your favorites! Here are a few other nutrition articles that you might like!